This has been the best thing we have made so far. I know - I know - It isn't a REAL Caesar salad if it doesn't have anchovies. But this blog is about making animal friendly versions of classic and not so classic dishes. There is no reason why we need to go by the traditional foodie definitions - WHEN LIVES ARE ON THE LINE! C'MON FOLKS! 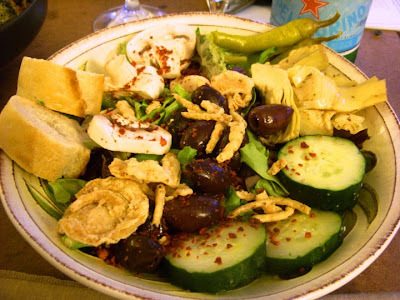 For the salad - We replaced the anchovies with marinated artichoke hearts and tossed in some of the fixings from the Greek Salad : Kalamata Olives, Cucumbers, French Fried Onions, Bacos and a few mushrooms from the Chickn Tetrazzini. The result : we had a salad worth a post all her very own! A salad that will outlive this project and has convinced us to never again buy a bottle of salad dressing. Sorry Paul Newman. We had a nice run but this was what we have been searching for in your cleverly labeled bottles all these years. We can still be friends. Well - until we find a way to make our own Newman-Os. Anyways - without further ado . . . the Caesar Salad Dressing that has changed our lives. . .
Toss it all in a tight container and shake and eat over a bed of your favorite salad stuff. be prepared to see this again. . . The link for vegan Worcestershire sauce turned up an unavailable product. It's not easy to find, but Annies makes one. It's not certified kosher so we make our own. There are a number of recipes available for it on line. I'm going to try this dressing on my own version of Caesar salad. I use lots of garlic crouton, plenty of vegan Parmesan (made from ground nuts-usually almonds and nutritional yeast. I never miss the dairy, egg or fish. Oh! The Wizard's vegan, organic Worcestershire sauce is also wheat-free!! They don't sell MATCH products in Canada. FML!